With the success of La La Land, the appetite for original musicals – i.e. not based on any previous film/stage production/artist’s entire musical library etc – is strong once more. It has also allowed a project like The Greatest Showman, a film that took seven years just to get made due to producers’ then-reluctance to back an original musical, to finally gain some traction – in fact, La La Land songwriters Benj Pasek and Justin Paul contribute heavily to the soundtrack of this movie as well. But as much as it so desperately wants to be, from the sheer dedication of its performers and the fun music, The Greatest Showman just has one too many flailing parts to even be in the same category as some of the great musicals out there. The film chronicles the highs and lows of the early days of the circus, specifically P.T. Barnum (Hugh Jackman) and his wide-eyed showmanship skills that he decides to put to good use, in order to support the debutante girl Charity (Michelle Williams) he met as a child, and later married and had two children with. His vision of a spectacle involves hiring people of all sorts of different colours, shapes and sizes to perform for a paying audience – these people include a bearded lady (Keala Settle), a little person (Sam Humphrey), and a black trapeze artist (Zendaya) who catches the attention of Barnum’s business partner Phillip (Zac Efron). 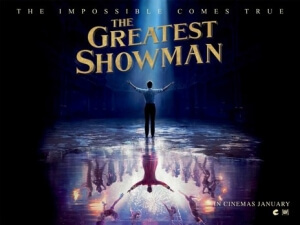 Along the way, Barnum encounters angry mobs, snooty critics, and a Swedish singer (Rebecca Ferguson) whom he develops a serious fascination for, all the while trying to keep everything he loves in close reach. The biggest problem with this movie is its noticeable lack of narrative focus, as the movie never truly settles on what kind of story it wants to tell in this romanticised version of real events. As we see Barnum putting together his troupe of performers, not once does the script ever give us an indication of what kind of people these characters are supposed to be, and for a film that celebrates those who look different than others it pushes them to the side more often than not, so it can focus on what Barnum or any of the other more handsome people are up to instead. It’s already a pretty shaky foundation on which to build a story about tolerance and acceptance, but then about halfway through it becomes about Barnum pursuing other things, and in turn begins neglecting his former associates in manners that seem very out of character for him by this point. It’s a bit of a jumbled mess, with so much material clearly having been cut out to get it to under two hours that a lot of it feels missing, but as a result it doesn’t flow as naturally; characters will suddenly have a connection with each other in what feels like no time at all, and if this were a longer film – albeit one with a slightly stronger script – it’s likely that these holes would have at least been filled in much more noticeably. While the script doesn’t really have as tight a narrative as it desires, there is a fair amount on screen to still be relatively impressed by. It’s a very active movie, with heavy choreography and impressively blocked dance sequences, not to mention actors who are clearly giving it their all (Jackman is a fine singer and performer, and puts that to good use here too), and of course songs that are fun to watch and listen to in the moment. It’s kind of like watching a movie version of one of those fluff stage musicals on the West End, which don’t have particularly strong narratives but try to make up for that with as much enjoyable singing and dancing as they can possibly give the audience. It’s a highly effective method, as it never becomes too boring – even when it uses old clichés that make things way too predictable – to lose complete interest in, but at the same time it doesn’t offer much substance to counterbalance the effortless staging of an otherwise deeply flawed movie. The primary thing to take away from films like La La Land and now The Greatest Showman, even though ones like the latter aren’t really all that great, is that original musicals are finally coming back into fashion. Though we will certainly still get adaptation after adaptation, it’s encouraging to see a genuine love for the old-fashioned type of musical made solely for the screen in filmmakers nowadays, and hopefully their existence can usher in a whole new generation of original – and hopefully stronger – on-screen singing and dancing. The Greatest Showman has some admirable music and staging, but is ultimately undone by a severely unfocused narrative that never settles on what kind of story or characters it wants to give its paying audience.